Shooting weddings as a Pine Hollow Country Club wedding photographer is an absolute delight. Pine Hollow Country Club is located in beautiful East Norwich, New York. Pine Hollow has beautiful indoor locations for wedding day portraits, wedding ceremonies, and wedding receptions. Pine Hollow also has spectacular outdoor locations for wedding ceremonies and wedding pictures. I particularly love creating wedding day portraits on the rolling lawns of this country club. The light is beautiful, especially late in the day. It's an idyllic, picturesque venue sure to delight even the most discerning brides and grooms. On Wedding Wire, Pine Hollow Country Club has a spectacular five star rating. Clients of Pine Hollow weddings have left spectacular reviews on Wedding Wire, with glowing statements such as "don't bother shopping country clubs for a venue- go straight to Pine Hollow and start planning your dream affair." Clients praise Pine Hollow for their service and unparalleled customer service. They use words like "amazing" to describe everything from the food to the venue itself. I highly suggest checking out the reviews for yourself to see how many happy wedding clients Pine Hollow has! Every year I made pictures that I love. I have images that I deliver to my clients and I am proud of each and every one. I have images that I add to my website or Facebook business page and I am thrilled with each of those images. Then we have the competition images - and those are a different type of image. 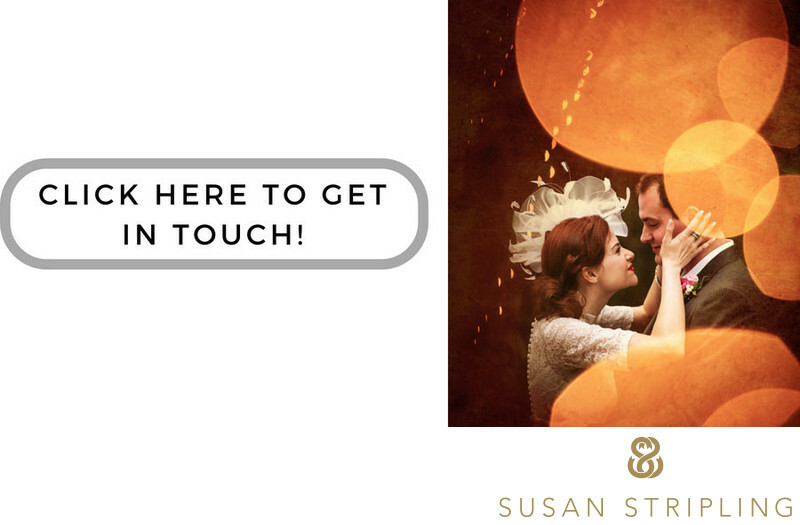 I compete regularly in competitions such as Fearless Photographers and the WPPI 16x20 International Print Competition and choosing images for them requires careful scrutiny. Everything is analyzed during a print competition, from the expressions on the subjects faces to the horizon lines in the background. When preparing my entries for the WPPI 16x20 Print Competition in the Wedding Photojournalism division this was one of my favorite images of the year. 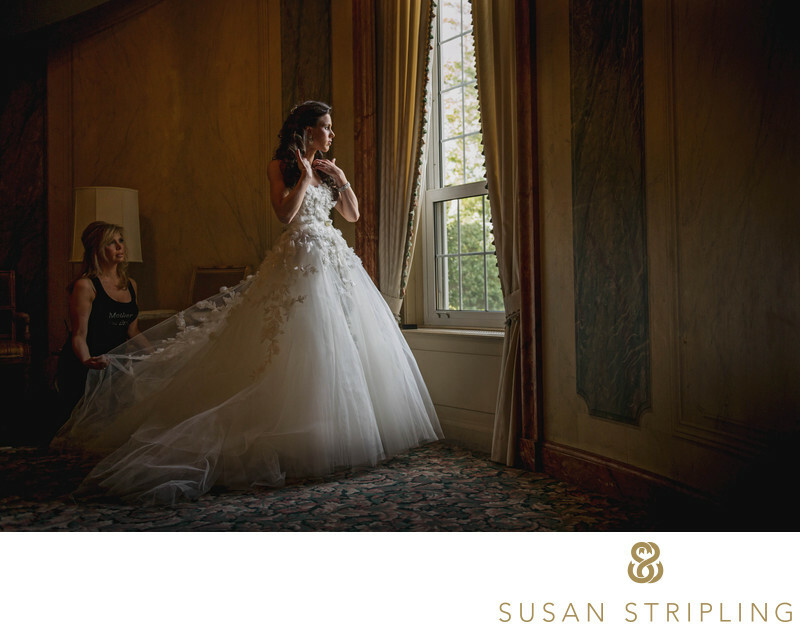 This image was taken during the First Look at a 2013 wedding at the Pine Hollow Country Club in East Norwich, New York. The bride had requested to see her groom for the first time at the bottom of this staircase. 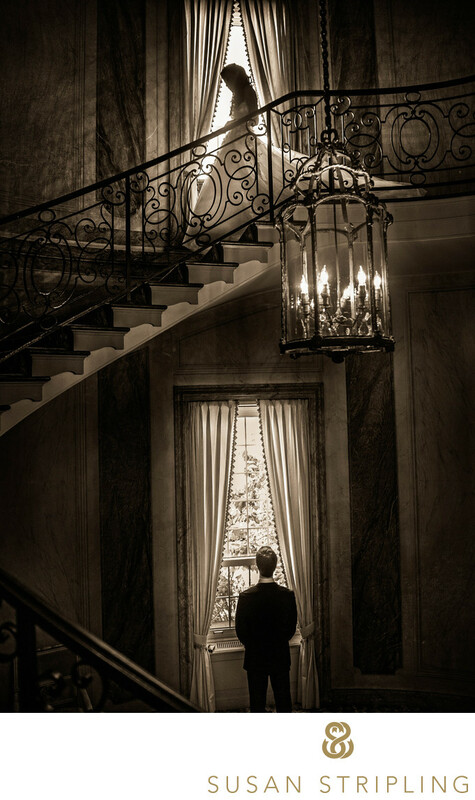 While waiting for his fiancee to walk towards him the groom went to the window and began staring out. 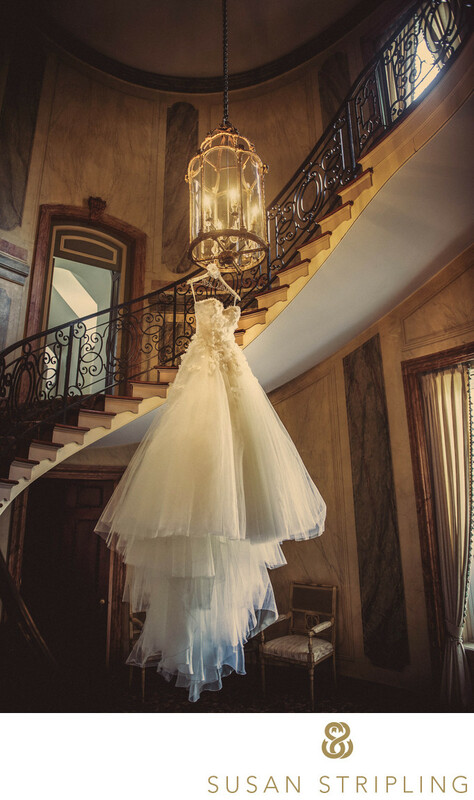 The bride, having positioned herself at the top of the stairs, began walking down. I waited on the stairwell and captured this frame the second the bride crossed in front of the upstairs window, perfectly mirroring her groom one floor below. This image fits the Photojournalism category because I had no hand in how it was made. The bride walked on her own from a position of her own choosing and the groom stood at the window without being prompted. I love the tones in the post-processing of the image. I love the motion of the bride juxtaposed against the static pose of the groom. I love the grandeur of the staircase and the beautiful pendant lamp. I was honored to document this moment and it remains one of my favorite images from 2013. Location: 6601 Northern Blvd, East Norwich, NY 11732. Keywords: East Norwich (24), long island (24), Pine Hollow Country Club (69), wppi (54). 1/160; f/2.8; ISO 1600; 24.0 mm.